More than 84 per cent of households in Berlin rent their home. Image: exilism/Flickr, CC BY-NC-ND. Housing affordability continues to be an issue of importance to voters in many regions. Different countries have adopted different approaches to improve access to affordable housing – with governments playing a central role in ensuring people are adequately sheltered, as well as being encouraged to buy housing where possible. In many countries there is an underlying desire by households to own their own home; in others, renting is the norm. In each case there are specific approaches, sometimes unique-to-that-country, that have helped address the issue of affordability. Here are five. In some countries there is a general culture of renting for accessing accommodation, rather than assuming all households should achieve home ownership. At times, renting is cheaper than buying. In Germany most households (54.1 per cent) are renters due to the long-term intervention in the marketplace by the government, as well as the accepted culture that renting is suitable over the long-term. 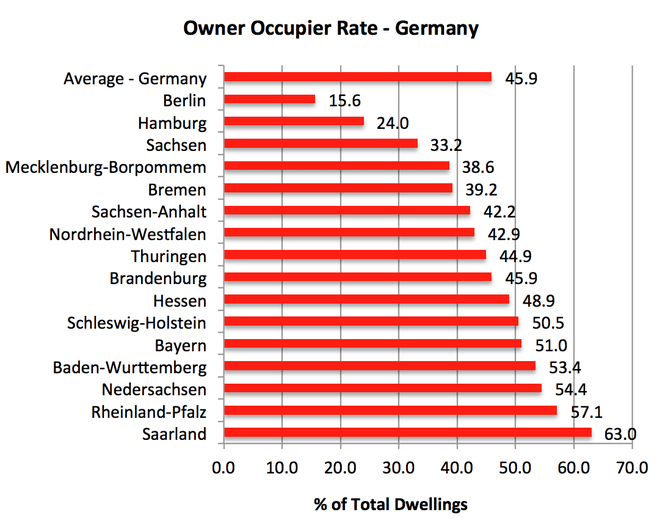 In Berlin a total of 84.4 per cent of all households rent. Providing this amount of rental accommodation is a major challenge without substantial government intervention or provision of housing. Source: Federal Statistics Office Germany, 2011. For example, in 2012 the German government paid housing allowance to approximately 783,000 households, equating to 1.9 per cent of all private households. Most of this funding (57 per cent) was allocated to single person households, who are unable to compete in the open housing market with multiple income households. (b) the minimum level of rent a landlord will charge. In the US, for example, this gap is bridged by the widespread use of a voucher system ,which subsidies the payment of rent to private landlords. This system is funded by the US government, and ensures tenants can access a minimum quality of affordable housing. In Singapore there is a high level of government intervention in the market, with the Housing and Development Board (HDB) providing approximately 80 per cent of all housing in the country. Approximately 90 per cent of households in Singapore own their own home; there are also grants for first time buyers and second time buyers in Singapore. In Hong Kong, about 29.7 per cent of residents live in public rental housing (PRH) provided by the government. In Scotland, a large proportion of the supply of affordable housing is undertaken by housing associations and local authorities. This collectively equates to about quarter of total housing accommodation in the market. 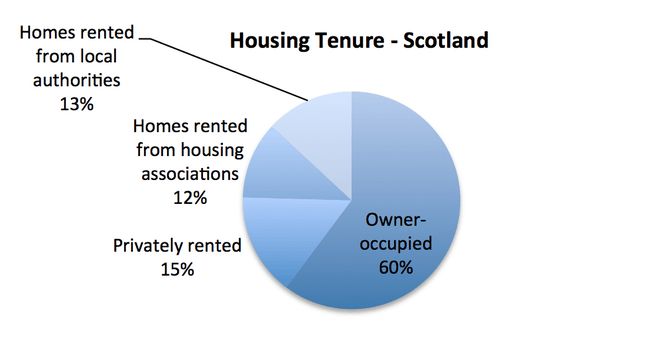 Source: Housing Statistics for Scotland, 2011. However – the recent trend for many countries, including Australia, has been the provision of less direct housing by governments. There are numerous examples of global cities making better use of limited inner-city land supply by encouraging higher density living in high rise units or condominiums, especially in Asian cities including Hong Kong, Macau and Singapore. The provision of affordable housing for purchase or renting is therefore more likely to be achieved in these circumstances, due to minimal land use and higher densities. However, high-rise living is not commonly accepted in many European cities, or in locations with a resistance due to cultural preferences for detached housing. The main driver of where a household lives is the need to be close to their workplace. As more affordable housing is usually located away from the central business district, the trade-off is cheaper homes but additional commuting time. 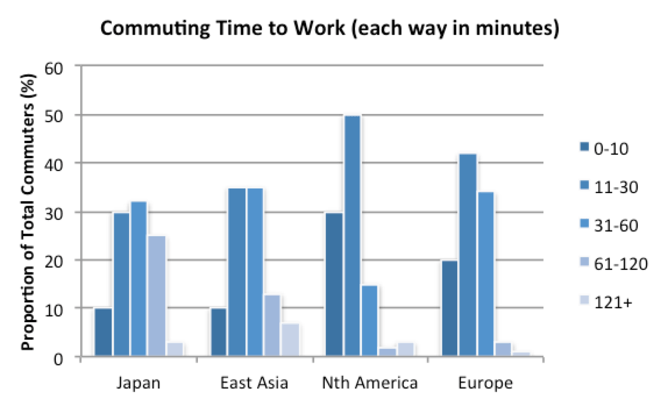 When this extended commuting time – of up to 2 hours each way – is combined with improved transport infrastructure such as in Japan, it is possible to access affordable housing in outlying satellite towns and cities where land is more affordable. In other words, governments which improve road and public transport infrastructure can also increase access to affordable housing. Lower demand can be achieved by limiting population levels and underlying demand for housing. But while this may not be an option for many governments, another option is to encourage multiple person households which otherwise would remain as single person households. According to the Australian Bureau of Statistics (2012), in 1911 the average persons per household was 4.5. By 1991, that had decreased to 2.7. Source: Wikipedia, compiled from various sources. Richard Reed is chair in property & real estate at Deakin University, Melbourne.